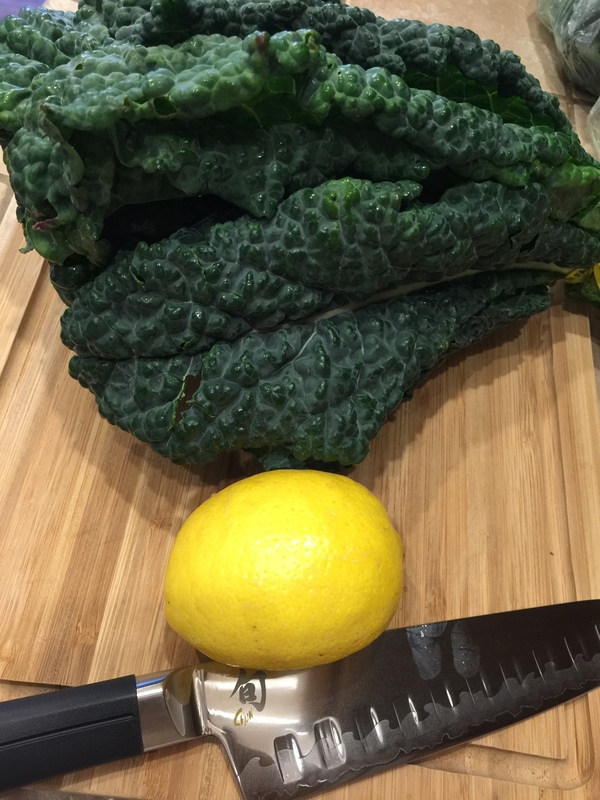 If using Swiss Chard or Kale, I prefer taking the ribs out and giving the leafy green part a rough chiffonade -- which basically means slicing it in long strips. Cutting the kale this way gives it a great texture and doesn't make it such a bulky-leaf salad. It's also just really fun to eat it that way! If you're using the brussel sprouts, just open the bag and dump it in a bowl! Once your greens of choice are in a bowl Zest the lemon over them. Pour the cheese over the greens. In a small bowl or measuring cup, juice the lemon (I use the entire lemon because I love the acid/taste). Slowly whisk in the extra virgin olive oil, than the red wine vinegar. Flavor with a dash of salt and pepper. I don't use a lot in the dressing because, again, I love the fresh lemon flavor on its own, plus there is a fair amount of saltiness in the breadcrumb mixture (we will get to that next) as well as the chicken that I toss in the salad (we will get to the chicken recipe, too). Place a small skillet over medium heat on the stove. Pour the 2 tablespoons of EVOO into the pan and let it warm up for a minute or two. Once the oil has heated up, carefully dump the gluten-free breadcrumbs into the pan and stir it up so that they're all fully covered by the oil and spread into a relatively thin layer. Let the bread crumbs toast up to a light golden brown then add the minced garlic and continue to saute for another minute. Season with the red pepper flakes and salt and pepper, mix while still over the heat for another minute to ensure it all gets mixed thoroughly. Remove from heat and set-aside. Pour the dressing over the salad and toss to coat it evenly. Pour 3/4 of the breadcrumb mixture over the salad next and again, toss to coat. I sprinkle the rest over the top of the salad for garnish. This salad is delicious just the way it is, I promise. It's a perfect side salad that goes with just about any main dish. It is also a great vegetarian salad as a main dish by itself. I add the chicken to make it a heartier meal, but, it is by no means necessary. I could eat this salad every night. Actually, I almost do eat it nightly... I might be obsessed with it. Tip: I keep a jar of the toasted breadcrumb mixture in the cupboard so that it's ready to go on a whim! I used whole almonds and chopped them up to a fine-coarse chop in my mini-chopper and added 3 tablespoons Almond Meal. The last couple of pulses I added the Parmesan cheese, zest, garlic powder, onion powder, salt and pepper in to make sure everything was chopped and well-incorporated together. Dump the mixture into a shallow dish that can fit a piece of chicken. In a 2nd shallow dish lightly beat the 3 eggs. In a 3rd shallow dish add the 1 cup gluten-free all-purpose flour. First, dredge the chicken in the flour, coating both sides thoroughly. Than dip it into the egg dish making sure that it is fully coated. Than pat it down in the almond mixture, pressing firmly than flipping and repeating on the 2nd side. Gently shake off any excess. Set aside on a clean plate. Repeat all steps to each piece of chicken individually. Discard anything remaining. Over medium heat, heat up the coconut oil (alternatively, you can use vegetable oil). To make sure it is the proper temperature, drop a few crumbs into the pan - if it bubbles quickly around it than the oil is ready. Using tongs, gently place each piece of chicken into the oil. Leave the chicken for 3-4 minutes than flip to the other side for another 3-4 minutes. All sides should be crispy and golden brown. If you don't trust the timing, you can stick a thermometer into the thickest part of the chicken and the temperature should be 165 degrees. Remove all chicken and place on a paper-towel-lined plate to absorb any extra oil. ​Once the chicken has cooled slightly (or, until it is tolerable for you to touch) Slice the chicken into strips or chunks and gently toss in the salad. Alternatively, you can serve a whole piece of chicken on top of a pile of the salad, too. When I serve the chicken whole, I like to add a little extra lemon zest & some fresh parsley over the top of it to brighten it up a bit. This salad with almond crusted chicken has so many variations & can be served hot, room temp, or even chilled. It's a great left-over for lunch the next day, too! Oh, and in my house, it is kid-approved-- WIN!